Prince Alfonso, Duke of Anjou, Duke of Cádiz, Grandee of Spain was a grandson of ex-King Alfonso XIII of Spain, a potential heir to the throne in the event of restoration of the Spanish monarchy, and a Legitimist claimant to the defunct throne of France as Alphonse II. The first thing that jumps out of this chart is the stellium or multiple conjunction of 6 planets contained within 32 degrees in Aries and Taurus in the 7th and 8th houses. This is made up of two conjunctions, the Moon and Venus in the 7th and the big one, a conjunction of the Sun, Uranus, Mercury and Mars in the 8th. 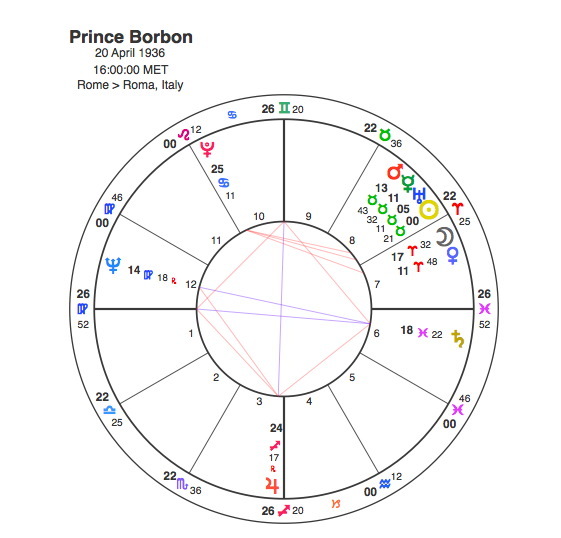 Regular readers of these pages will already be harbouring concerns for Prince Alphonso due to this combination in the 8th house. The 8th is traditionally the house of death and planets in this house can indicate themes surrounding the death of the person and also that of other people related to them, particularly if the nature of the event is unusual. These concerns may be concentrated on the possibility of accidental death given the involvement of Mars, Mercury and Uranus. The fact that Pluto is in square to both the Sun and Moon would seem to confirm these concerns. Alphonso’s Pluto is placed in the 10th house so as well as the issues around accidental death there are probably concerns about sudden changes in his social status. Anyone who has read these pages closely will be wondering what happened when Pluto transited to oppose this stellium. We will find out in time but first of all we should look at where Prince Alphonso was coming from. The past in a chart in terms of family background and inheritance would be found in the 4th house. Alphonso has Jupiter in its own sign Sagittarius conjunct the 4th house cusp and Jupiter is the apex of a T Square. This shows his noble birth together with high aspirations to continue and even expand on his family’s traditions. The only problem is that the planets that form the opposition that creates the T Square are Saturn and Neptune, which suggests there will be restrictions and limitations together with a subtle undermining of his standing. Its a T square that focuses an awful lot of energy on Alphonso’s family and inheritance but it doesn’t point to a successful outcome. Alfonso was the elder son of Infante Jaime, Duke of Segovia, King Alfonso’s second of four sons. The Segovias lived in Rome where Jaime’s father had maintained a royal court-in-exile since the royal family fled Spain following the 1931 election of republicans and socialists in Spain’s major cities. During the Spanish civil war General Franco overturned the republic and promised restoration of the monarchy whilst consolidating his own grip on power in Madrid. Following Alfonso XIII’s death in Rome in February 1941, Franco acknowledged Don Juan as rightful heir to the throne implicitly confirming that he considered Segovia and his sons excluded from the royal succession. In 1947 Franco brought in a succession law which defined Spain as a kingdom, but it empowered him to decide whom to enthrone and when. Alfonso was mentioned as a possible alternative to Don Juan and his son, Juan Carlos, should Franco consider the former too liberal a ruler. Relations between Don Juan and Franco continued to deteriorate and in 1952 Alfonso moved to Spain to be educated under the General’s guidance. Franco continued his dictatorship and no one ascended to the throne. In 1969 Franco offered to designate Don Juan’s son, Juan Carlos king whenever he stepped down from power, and Juan Carlos accepted. Alfonso agreed to be chief witness at the ceremony declaring Juan Carlos successor and in return for his full support, Franco appointed Alfonso to be Spain’s ambassador to Sweden. In 1969 Pluto was conjunct Alfonso’s Ascendant. Alfonso’s place at the top table was cemented when he married Maria del Carmen in 1972. Carmen was the first and favourite grandchild of General Franco. To celebrate the wedding Franco named Alfonso Duke of Cadiz and made him a Royal Highness, making Carmen a princess. A parallel development to all this was the French royal connection. From his birth Alfonso was considered a prince by those legitimists who believed that Alfonso XIII was also the heir to the French throne. When his grandfather died in 1941, Alfonso’s father Jaime succeeded him in this French claim and Alfonso was recognised as the Dauphin of France. In March 1975, Alfonso’s father Jaime died; he was immediately recognised by his supporters as King Alphonse II of France. In August 1975, he took the courtesy title Duke of Anjou. At this stage Alphonso was at his peak of his powers, considered to be the rightful King of France, a decent alternative to the suggested King of Spain and married to Franco’s favourite granddaughter. And it was at precisely this point that Pluto arrived in opposition to the stellium. Pluto reached opposition to Venus in November 1975 when General Franco died. Immediately Alfonso’s family lost a lot of their political power. Venus is in his 7th house which is appropriate as much of his power had been cemented by marriage, a state that is ruled by both Venus and the 7th house. The next planet in the stellium is the Moon also in the 7th and Pluto opposed it in 1979 when Alfonso and Carmen separated. Its worth remembering that Alfonso’s Moon in the 7th is in natal square aspect to Pluto and the other end of this was triggered in 1982 when Pluto transited to square its own natal position. This transit finished off Alfonso’s marriage as the divorce came through in 1982. So we’ve had the 7th house marriage transits, this is followed by the 8th house ones. As part of the divorce settlement Alfonso was granted custody of his two sons. In 1984 Pluto came to make its most powerful transit of his life, in opposition to the Sun. Its worth remembering that Alfonso’s Sun is in conjunction with the sudden, disruptive and accident prone Uranus because in February 1984 he was involved in a tragic car accident that killed his older son. Alfonso was found to be negligent in the accident and he consequently lost custody of his younger son for six months. The next planet in the stellium is Mercury and Pluto was in opposition to it from 1987 – 88. In 1987, Prince Henri of Orléans, the then Orléanist claimant to the defunct throne of France, initiated a court action against Alfonso for his use of the title Duke of Anjou. In December 1988, a Tribunal ruled that the lawsuit was inadmissible. Lawsuits would be ruled by Mercury with a little bit of Jupiter thrown in. The final act of the stellium was the opposition between Pluto and Mars in 1988 – 89. Alfonso was an avid skier. Perhaps not surprisingly with the Moon in Aries and a Sun / Mars /Mercury / Uranus conjunction it is said that he drove and skied with great speed. He served as president of the Spanish Skiing Federation and president of the Spanish Olympic Committee. Tragically he died in a skiing accident on January 30, 1989. A stellium is an intriguing astrological pattern. It inevitably places great focus on the signs and particularly the houses involved. When Pluto comes to such a pattern by transit it does so with great force because it impacts on so many planets in a relatively short space of time. In Alfonso’s chart all of the personal planets, the Sun, Moon, Mercury, Venus and Mars were involved together with the erratic and accident prone Uranus. His downfall from 1975 to 1989 was complete as each separate planet was ticked off one at a time.